During my trip to Weihai in China to participate in the 2014 ITU Long Distance Triathlon Championships, I bumped into Marcin Sochaki – the Director of Rocket Science Sports. Marcin was promoting Rocket Science Sports and its products when he informed me of his background. Coincidentally, he is an Aerospace Engineer and used to work for one of the largest aircraft manufacturing companies in the USA. As an Aerospace Engineer myself, we began chatting about our experiences in the industry and I later came to realise that Marcin used his scientific and engineering knowledge to design and manufacture his own swimming wetsuits. As all engineers do, they get excited about the technical aspects of any product and we therefore began digging into the technical details of the range of wetsuits offered by Rocket Science Sports. Our long discussion resulted in me becoming a sponsored athlete and here I am writing a review on my first Rocket Science Sports wetsuit – The Aquasense. I ordered the Aquasense in a size “small” as per the sizing guidelines. I chose the Aquasense wetsuit due to the advantageous technical specifications and I was looking for an upgrade to my previous entry-level wetsuit; the Xterra Vortex. The wetsuit came exquisitely packaged in a carry bag which you can use to transport your suit when you train in the open water or participate in a race. The carry bag itself has a lot of technical detail about the wetsuit for you to read over and brag about to your fellow triathletes when you tell them that the reason why you are faster is simply due to the wetsuit! 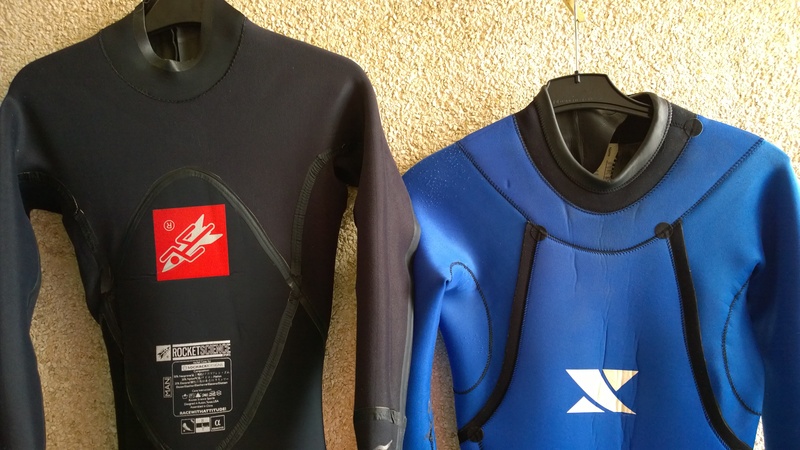 When I first opened the packaging and held the Aquasense wetsuit, I immediately noticed the difference in weight in comparison to my previous Xterra wetsuit. The Aquasense is much lighter in weight and the material feels much smoother. In addition, the material is more flexible in areas such as the shoulder region and has varying thicknesses in regions near the hips. YAMAMOTO is the name of a Japanese company that manufactures neoprene rubber. The majority of wetsuits are made from YAMAMOTO neoprene and the company employs a simple numbering system to its latest neoprene. For example, number 38 was once a premier neoprene and has now been demoted to lower end wetsuits since the introduction of the number 39 and 40 neoprene. Number 39 has been used extensively for the past few years in wetsuits manufactured by BlueSeventy, 2XU, Xterra and other popular brands. The arrival of number 40 meant that the latest neoprene is much more flexible and buoyant – according to YAMAMOTO. It is the natural tendency to think that ‘more is good’ but with the case of number 40 neoprene this is not true. Extra flexibility brings its challenges too. A more stretchy material has the potential of tearing more easily and the manufacturers have to re-think the design of the wetsuit to ensure the wetsuit fits the athletes correctly. The Aquasense is the optimal solution as it only uses number 40 in areas such as the shoulder and knee region for added flexibility and retains the number 39 in other areas. 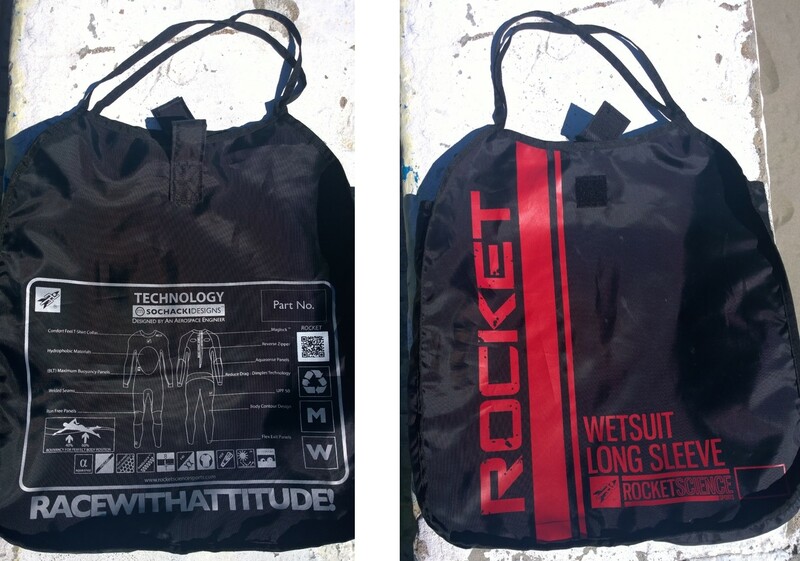 This has lead to the cleverly designed wetsuits by Rocket Science Sports. 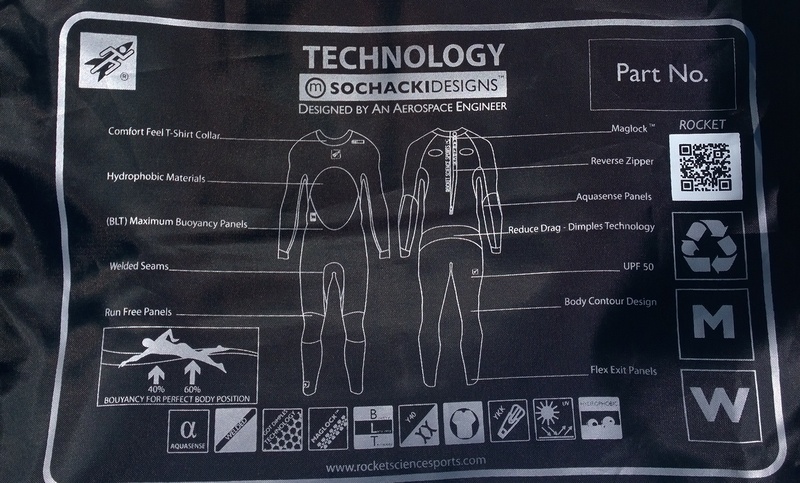 Rocket Science Sports has developed its wetsuits using Buoyancy Laminated Technology (BLT). It assures that each wetsuit is light and flexible, and gives 40% to 60% buoyancy distribution that allows perfect streamline position in the water. Another feature that Rocket Science Sports has adopted is welding the various components of the wetsuit together. All wetsuits are made up of individual components such as the sleeves, upper torso etc and all these components have to eventually be stitched together to form a complete wetsuit. With the Aquasesne, the components are not only stitched but also welded therefore ensuring that the wetsuit is much more durable and will last longer! This is evident in the picture below. The Aquasense on the left is stitched and welded at all locations whereas my previous wetsuit, the Xterra, is only welded in some locations. Its unique aerodynamic design, modeled after the golf ball, minimizes drag by up to 16% when swimming. The majority of drag associated whilst swimming results from the separation of water from the athlete’s body causing what’s known as pressure drag. The dimples actually add more kinetic energy to the water flow which forces it to remain attached longer to the athlete’s body and ultimately reduces pressure drag. These dimples have been incorporated just above the hips and on the upper back as shown in the pictures above. It is in these locations that water is most likely to separate from the wetsuit. The Aquasense wetsuit was named accordingly due to a unique feature that is only found on this wetsuit. The ultrathin Aquasense panels located on the forearms enable exceptional feel for the water resulting in better stroke per distance and therefore improved swimming efficiency. An experienced swimmer will know that the “pull” phase of the swim stroke consists of engaging the core and using the entire forearm. I received my wetsuit in February whilst in the UK and I had no intention of venturing into an ice cold lake! 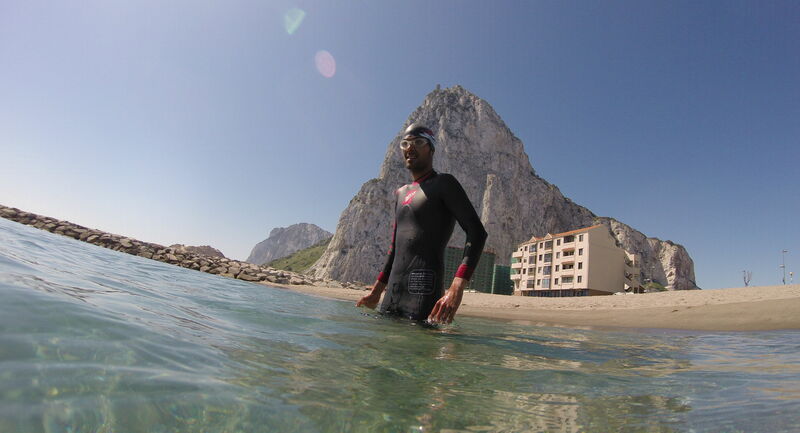 I therefore waited until my next visit to the warmer climate in Gibraltar to trial the wetsuit. First things first, the fit was superb! Not only where there no air pockets when I slipped into the suit but also getting into and out of the wetsuit was straightforward and effortless. The suit didn’t feel “heavy” on me as my previous suit did and my shoulders were able to rotate freely without any constrictions. I did notice however that the arms and legs of the suit fall slightly short of my wrists and ankles. I prefer the suit designed in this manner as it enables me to fasten my watch on my wrist and chip timing bracelet on my ankle when it comes to a race. Speaking of racing, I used the suit in my first race of the season at Triathlon Porto Colom in Mallorca and you can see me in action with the wetsuit in my race summary blog! After training and racing in the suit I believe I have found the perfectly designed suit with regards to buoyancy, flexibility, fit and weight. All these aspects are important when choosing a wetsuit since you as an individual need to feel comfortable in the suit especially in endurance races. 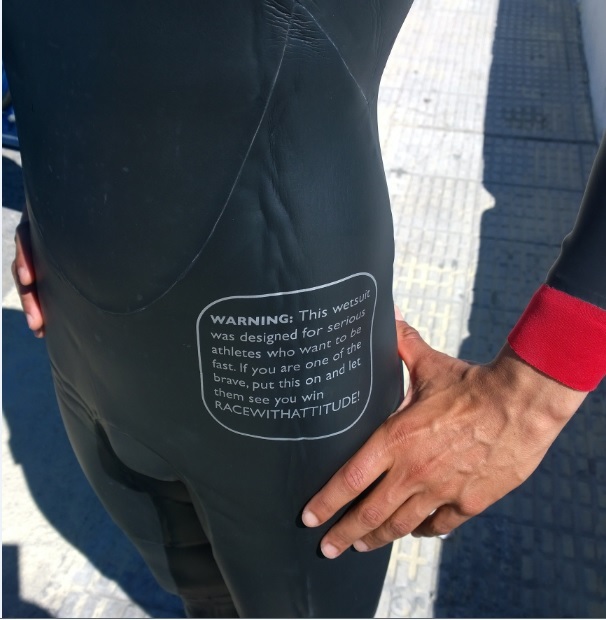 Did I mention the WARNING that comes with the wetsuit? Visit www.rocketsciencesports.com to find the full range of wetsuits, swimsuits, tri-suits and other sports gear available from Rocket Science Sports!